Scarce map of the Judeo-Christian Fifth Age lasting between the consecration of the Temple of Solomon and the end of the Babylonian Exile. Cinquieme Age Depuis la Dedicace du Temple de Salomon; Jusqu'a la Liberte reconnue aux Juifs par Cyrus. 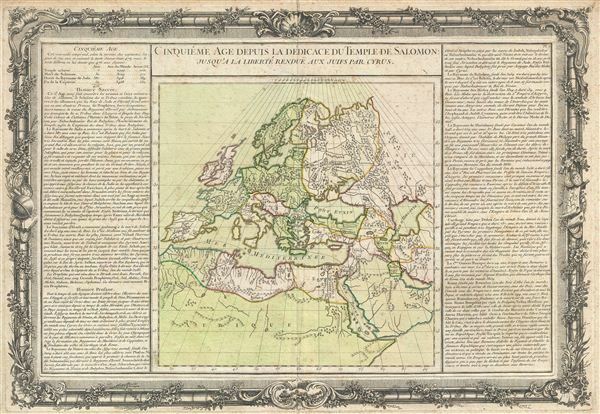 An exceptionally scarce c. 1761 map of europe, North Aria, and the Middle east prepared by Desnos in 1761. Desnos drew this map to illustrate the world in the 'Fifth Age.' In Judeo-Christian tradition, this period covers from the foundation of Solomon's Temple in Jerusalem to the termination of Jewish captivity in Babylon under Cyrus the Great. Cyrus, the King of Persia, was apparently inspired by God to end the Jewish exile and return the sacred vessels looted form the Temple of Solomon so that they could be used in consecrating the Second Temple of Jerusalem. This map curiously covers not just the pertinent areas, but whole world in three parts, europe, Asia, and Africa, as it was then understood. Important nations and cities are noted, including Israel, Judea, Babylon, Media, Persia, Armenia, Cappadocia (Turkey), Rome, Macedonia, egypt, Gaul (France), Carthage, and Spain. The map proper is surrounded by extensive descriptive French text describing each of these regions in detail. The whole is surrounded by the highly appealing baroque border typical of the Atlas Methodique. This map is surprisingly scarce since it was issued in a well-known and popular 18th century atlas. We have been able to identify no individual examples from auction records over the last 30 years, and only 4 examples in the OCLC. There are however, numerous institutional examples of the containing Atlas methodique et elementaire de geographie et d'histoire. Buy de Mornas, C., Atlas méthodique et elémentaire de géographie et d'histoire, (Paris: Desnos) 1761. Good. Some foxing. Original centerfold exhibits wear. Blank on verso.